Chem-Dry Clean & Fresh Carpet Cleaners in Mosman utilises a highly effective and unique Cleaning method that is safe for the entire family. 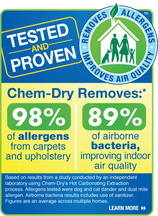 Your Carpet's, Rugs & Upholstery are 'Deep Cleaned' 'The Natural Way' removing nasty allergens & significantly improving airborne activity in your home . Using only Green Certified Non-toxic products, this mean our process is safe your kids & pets. Commercial & Domestic/Residential Carpet Cleaning, Rug Cleaning & Protection Mosman, Environmentally Friendly Carpet Cleaning Mosman, Upholstery & Mattress Cleaning & Protection Mosman, Leather Cleaning & Conditioning Mosman, Dust Mite Treatment, Sanitise and Deodorise Mosman, Flood Damage & Restoration in the Mosman area, Main Cleaning Solution 'The Natural' - Only from Chem-Dry, Credit Cards & Cheques are welcome, Fully Insured + we shift furniture!​, Experience the Difference using ChemDry today! Indoor air quality is a significant home health concern because the average home harbors about 200,000 bacteria for every square inch of carpet. As the bacteria builds up, the bacteria lurking in your carpets gets stirred up and circulates in the air your family is breathing unless you clean it. Chem-Dry Clean & Fresh Carpet Cleaning Mosman is not only effective at removing the bacteria from the carpets we clean, but it also improves the air quality in your home. FAQ: Why do I need Protectant on my carpets?